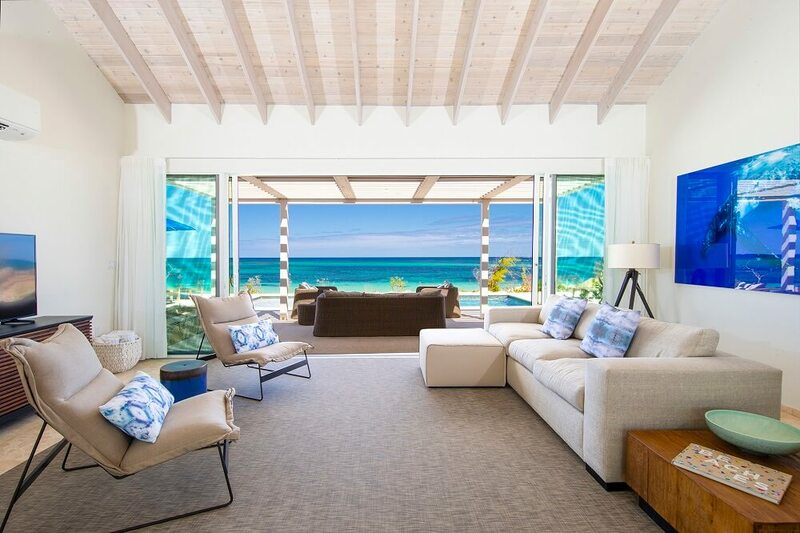 Located directly on the beach, the Three-Bedroom Beachfront Villas are elevated twenty-five feet above sea level for exceptional oceanfront views, with immediate access to the beach. Open-plan great room with exposed, vaulted ceiling, fully equipped eat-in kitchen with island, pantry, living and dining room and a washer and dryer. Three bathrooms, of which two have double vanities, large soaking tub, WC, over-sized walk-in shower, and outside shower garden. The third features double vanities, water closet and an over-sized walk-in shower. Sheltered garden patio with native stone privacy walls. Spacious oceanfront poolside terrace and terrace garden, complete with a large heated pool (34’ x 15’), complete with a pergola for shade and ample seating.